The Pastiche name appeared in 1992, six years after Coachman was founded, and has been a mainstay of the firm ever since. It provides a bridge between the affordable Vision and the top-spec single-axle VIP. Traditionally, the model has used the same body as the VIP, but with slightly less kit and a different finish. For 2015, however, Coachman has made the decision to switch to the shell of the Vision, which was launched last year. It’s a shade narrower, at 7ft 5in, but the change brings two important benefits: cost and weight saving. Neither had been confirmed as we went to press, but we expect the price to be down by a useful £800 or so, and weight to drop by around 50kg. For the smallest model, this 460/2 two-berth with an end washroom, that should mean an MTPLM of somewhere in the region of 1375kg. 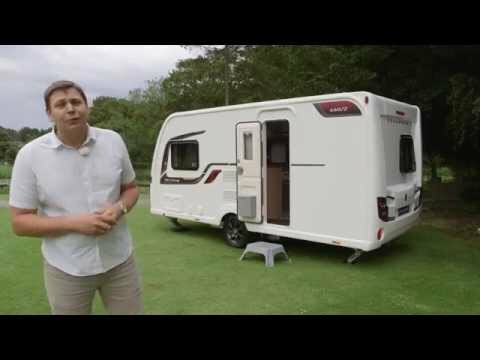 Practical Caravan reviews the Coachman Pastiche 460/2 to find out more. Like the Vision, Coachman's Pastiche now features polyurethane framing for the sidewalls and bonded construction – with no fixings to give water a route in. It also features a completely new look, though we’d liked to have seen a little more visual distinction from the Vision. You’ll spot the Pastiche by its bold graphics and panoramic front window, but it shares the Vision’s graphite alloys and matching trim for the light clusters and grabhandles. Nevertheless, there’s all the kit you’d expect from a high-spec two-berth. There are heavy-duty steadies and the Al-Ko chassis boasts an AKS hitch stabiliser and ATC anti-snaking device, while in the nearside wall there’s a point for a gas barbecue, plus an outlet for the blown-air heating to warm your awning. Some might expect an Alde system at this level, but Coachman is only a recent convert – for its flagship VIP and Laser ranges – and there is touch-screen control for the programmable Truma Combi boiler. It may appear similar to a Vision from without, but from within the look and feel of this Pastiche 460/2 are clearly borrowed from the upmarket VIP – a handy bit of kit sharing between the Coachman caravans. There’s that standard sunroof and a huge Heki rooflight, giving a wonderfully airy feel, while the attractive ‘Noce Lido’ wallboard with chromed fittings looks solid and well finished. We at Practical Caravan think that the new upholstery is subtle yet very pleasing, with generous armrests and contrasting scatter cushions and curtains, and there are jewel-like chromed LED spotlights for readers. We loved the contemporary kitchen of the Coachman Pastiche 460/2, with its white cupboard doors, natty splashback and domestic-style square taps (both from the VIP), plus slate-effect worktops. There’s plenty of storage thanks to the fridge/freezer’s position on the nearside, but at first it seems as if the food preparation space is at a premium – until you turn around and spot a large worktop (at the same height) above the fridge. Above that you’ll find the microwave sited inside a locker – a nice idea, because these are never the most attractive appliances. We also liked the proper-sized Hartal bin, which should please rallyers, and there’s a dual-fuel four-ring hob and separate oven and grille – though cooks will need to watch out for the washroom door, which swings out into the cooking area. The Pastiche bathroom is excellent. The Practical Caravan review team feels it's a great size for a compact two-berth van, with a circular shower – albeit not as large as that of its Lunar and Bailey rivals – and there’s a good-sized sink, though it is set a touch too low for comfort. The backlit mirror is another detail borrowed from the VIP, and it adds a pleasant warmth to the room. There’s the water-saving Ecocamel shower head, too, though we would have preferred a smoked finish to the washroom window to avoid having to pull down the blind for privacy. Although the Vision body is 5in shorter and 2in narrower than its VIP equivalent, the Pastiche 460/2 doesn’t feel pinched inside and when you pull out the bedframe from beneath the offside sofa it forms a good-sized double. It’s comfortable, too. Like the rest of the Coachman caravans range, the Pastiche has adopted the new Ozio polyester fibre for its cushions and mattresses. It’s claimed to be up to 30% lighter than traditional sprung mattresses, as well as being breathable and recyclable. But the main thing is that it’s very comfortable. The main storage space is a colossal wardrobe in the washroom, with shelving to the side and another set of shelves within – plenty of space for a couple’s clothing when touring. To the side of it there’s a neat hidey-hole for the freestanding lounge table. Up front, the lounge chest has two good, usable drawers, thanks to the decision to move the fusebox to beneath the offside bunk. There are no soft-close runners but, like the rest of the van, the unit feels superbly screwed together. The only gripe is the lack of positive catches for the overhead lockers. It will be interesting to see how hardened Pastiche fans react to the change from the VIP body to the slightly smaller Vision shell. It’s a brave move by Coachman, but one that makes complete sense when you take into account the savings in both weight and cost that it brings. Not only that, but the firm has also worked hard to ensure that Pastiche loses none of its affordable luxury feel, making it a smart option for couples on their caravan holidays.